As flu season approaches parents to need to make a decision—whether or not to get their child a flu shot. The flu isn't just a stronger version of the common cold. It's a serious illness that can often lead to a hospital stay and can even be fatal. Lasting about a week, those who contract the flu have a wide range of symptoms including a cough, headache, runny nose, fever, and exhaustion. Complications include ear, sinus and staph infections, and pneumonia. According to the Centers for Disease Control and Prevention, those children who live with chronic conditions like asthma and diabetes are five times more likely to be hospitalized than their healthier counterparts. Flu season typically starts in December and peaks in February, although every strain of the virus and season varies. If you dread the idea of taking your child to the doctor's office to get a flu shot and the tears, kicking, and screaming that goes along with it, think about the alternative—taking care of a very sick child, or worse, spending time at their bedside at the hospital. Surprise—Don't tell your child where you are going and what's going to happen until you get there, holding back until right before the doctor or nurse gets ready to give the immunization. Although it seems harsh, it eliminates a lot of the feelings of nervousness that may accompany the news that they need to get a shot. If your child is a worrier, this may be the route to go. Why have they thought about the doctors visit for a few days or hours in advance when the reality is they'll only be in pain for about five seconds (if at all)? 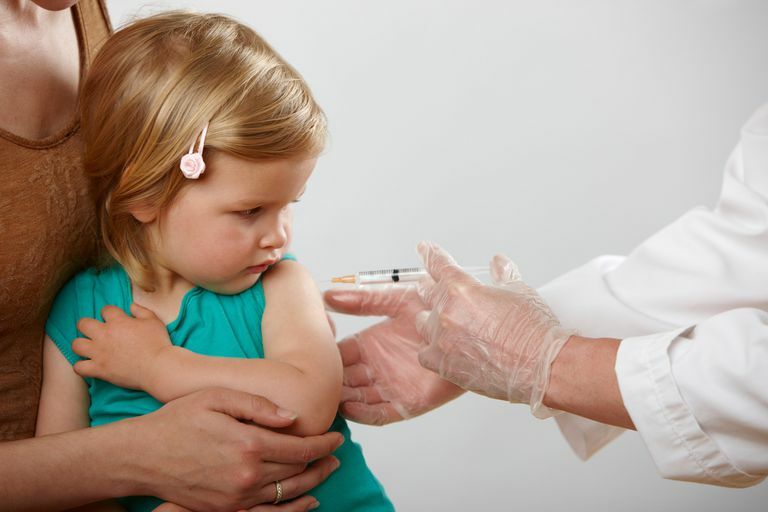 The downside with this method is that your child may start to fret every time they go to the doctor, for fear that they will need to get another shot. You'll have to make it perfectly clear that a shot isn't something that happens every time. Educate—The day of the shot, or a few hours before, explain to your child exactly where they are going and why. Talk about how sometimes during the winter months people can get very sick, but that doctors and scientists have come up with a way to help everyone stay well. If they get a quick shot, they may still get sick, but not as sick as they could. Be careful not to go into too many details, however. You don't want to scare your child. Keep it simple and to the point and answer any questions your child might have. Explain to your child that it is OK to be nervous and maybe share your own shot experiences. Talk about how you too were nervous, but after a few minutes, you couldn't feel any pain at all. If you think it will help, try practicing ahead of time, either for your child, yourself or on a doll. Practice rolling up sleeves or even rubbing with a cotton ball. Spray—Depending on your pediatrician, your insurance company, and your child's overall health, your child may be eligible to receive FluMist, a nasal-spray vaccine that has been approved for use in kids ages two and up. Children who have asthma or frequent wheezing problems are not permitted to use the spray because it can agitate symptoms. Not all insurance companies cover the spray, however, so you'll need to look into that. If they are old enough to read, have them read aloud to you. Play a game of "I Spy" (just make sure your child doesn't look where the shot is being given). Talk to your child, distracting them from what is going on. Blow bubbles or a pinwheel—make sure this is OK with your doctor first. Hold and comfort your child before, during, and after the shot. Come prepared with fun bandages that your child has picked out ahead of time. Put the bandage right on after the shot. If your child will be getting the FluMist vaccine and you aren't certain how he/she will react to the spray, practice ahead of time with saline nasal spray. Don't expect your child to behave logically. They are scared and uncertain and need you to be calm. Don't threaten them or call them a baby if they cry. And when the shot is over, don't say, "See, that wasn't so bad." It can minimize your child's very real feelings. Remember, your child isn't the first and won't be the last who has had a hard time getting a shot. When it's all over, hold your child and comfort them if they need it. This might even be a good time to go out for ice cream!